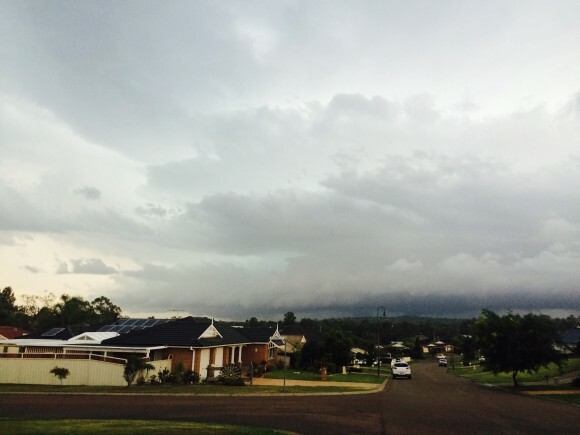 STORM WARNING For people in parts of the Blue Mountains/Hawkesbury and Maitland/Cessnock areas. Issued at 4:11 pm Wednesday, 10 December 2014. 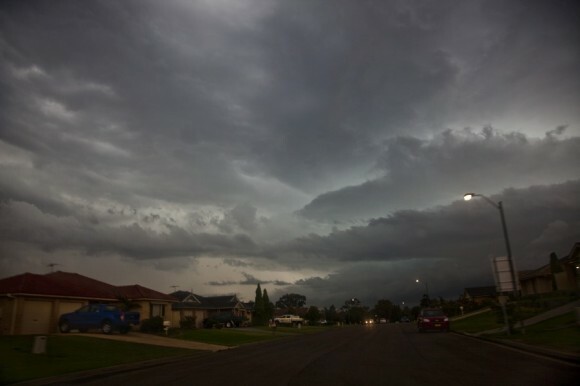 The Bureau of Meteorology warns that, at 4:10 pm, very dangerous thunderstorms were detected on weather radar near the Yengo National Park northwest of St Albans and the Putty/Howes Valley district. These thunderstorms are moving towards the northeast. 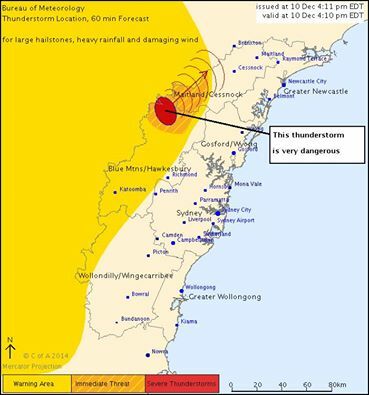 Very dangerous thunderstorms are forecast to affect the Yengo National Park southwest of Wollombi by 4:40 pm and Wollombi, Congewai in the Watagan Mountains and Pokolbin by 5:10 pm. Large hailstones, heavy rainfall that may lead to flash flooding and damaging winds are likely. 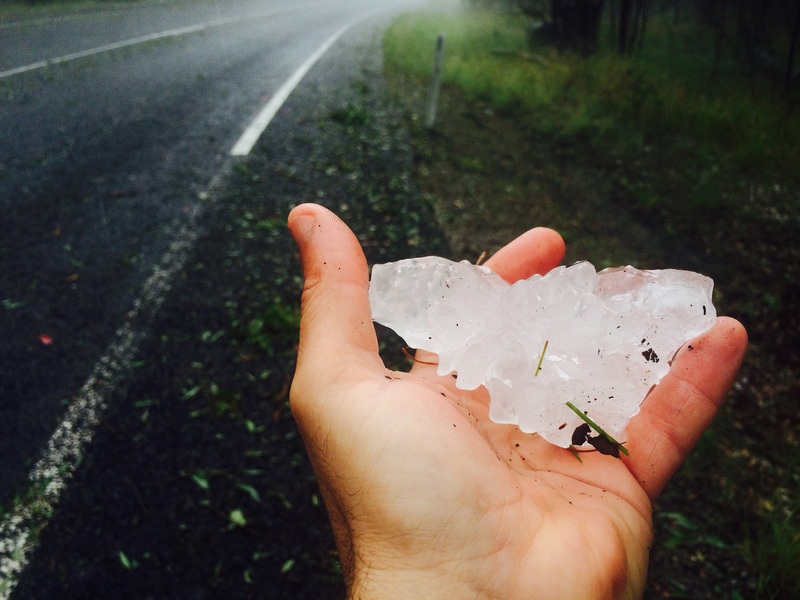 10cm Diameter hailstone! 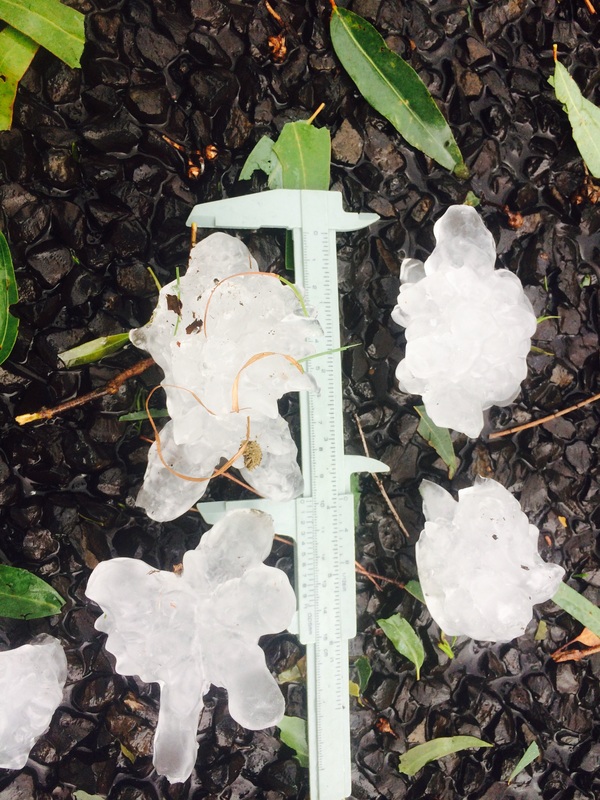 Other hailstones to 8cm surround it - note the conglomerate shapes Also note the stripped leaves leaf litter indicative of a severe hail event! 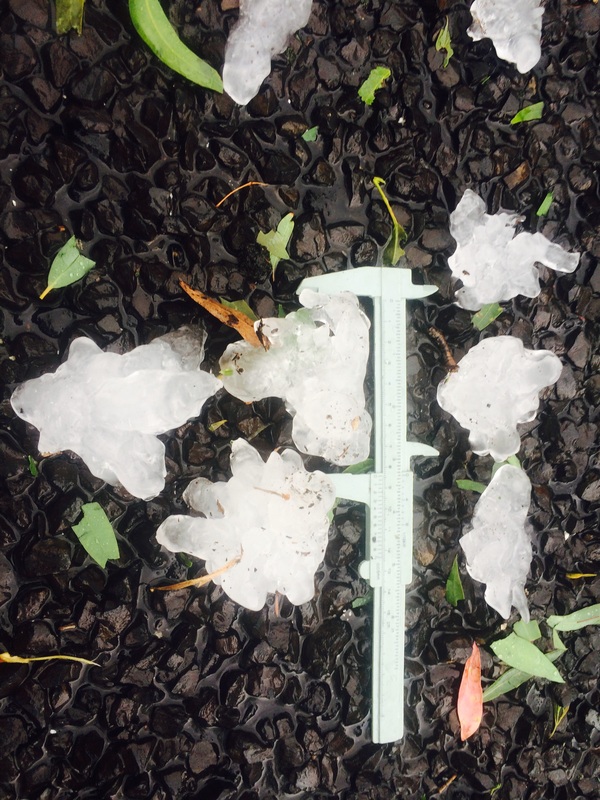 Calipers are important in accurately measuring hailstones. The longest point to point length should be used but if possible also measure the shorter lengths. In more ideal cases, weights should also be measured or perhaps store these hailstones in a refrigerator. Just returned from a chase of insanity! Left Bidwill 3:05pm, and it was a mad rush to be ahead of any traffic to get to the Putty Road. 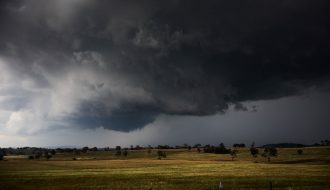 Once on there, it was full steam ahead to make up ground on the supercell that had just turned left near Colo Heights. With only a couple spots of reception, I had to make do with visuals. I looked for hail all the way from Colo Heights - no hail. And then north of there. No hail. Down the first hill - still no hail. It then dawned on me - just look for leaf litter - derr! Still no litter nor hail!. This puzzled me - I turned around a corner and suddenly left littler! Hail could be seen on the side of the road. 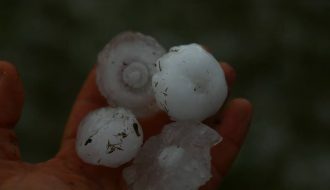 It was not until a kilometre up that I noticed extreme stripped leaf litter and then the hailstones seemed like at least golf balls from the window so close examination was in order. And to my astonishment - huge hailstones everywhere! And they were more jagged than anything I had observed previously! I immediately measured hail to 8cm and then looked for larger and there was one with spikes such that the length were 10cm long! 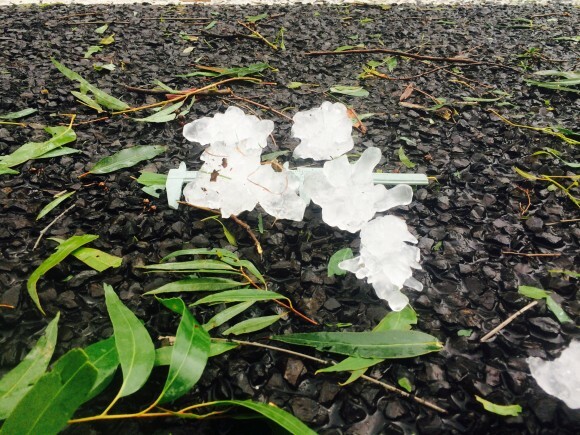 Not since 2003 on the infamous Tyndale chase had I seen hail this large - not even the Blacktown hailstorm! To say I was excited is am understatement! 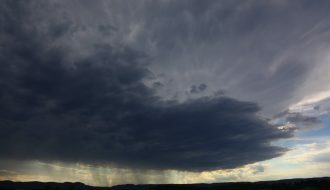 This was simply not part of the recipe for today's forecast although I was anticipating supercells. I wanted to stay and sample everything but I had to simply head north and finally got into hailstone territory at the infamous winding road section of the Putty Road. 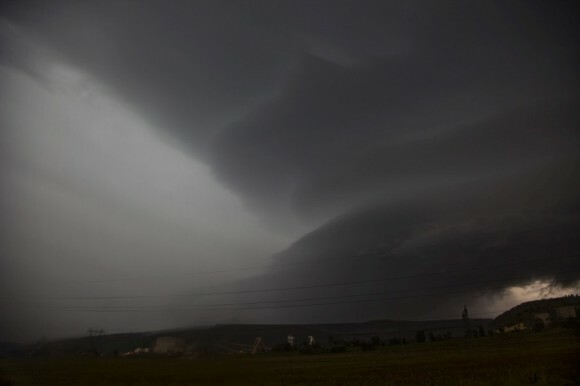 Lightning bolts descended from the core. The hail got too large for the vehicle in front of me who stopped so it allowed me to make up a little ground. On approach to the Cessnock turn-off, more large hailstones pounded the vehicle perhaps to about 4 - 5cm. The main core was further west of the road. 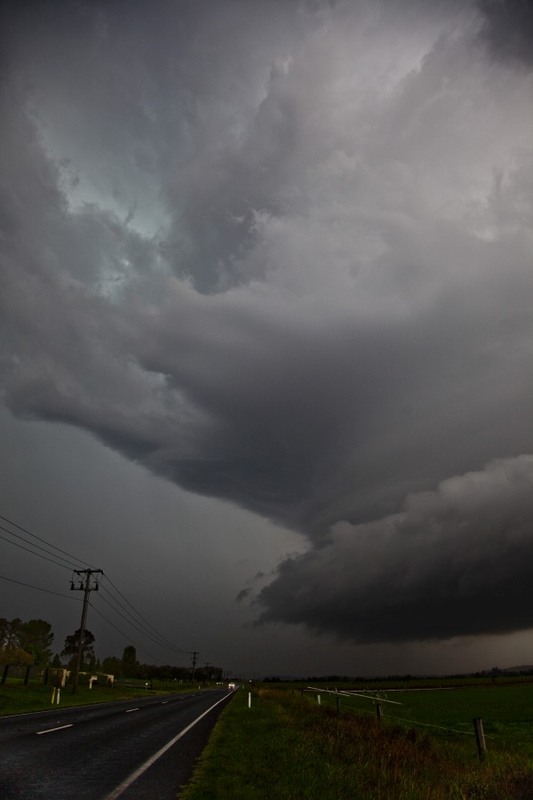 I was out of the main hail core past Bulga and began to note structure despite the annoying anvil raindrops! 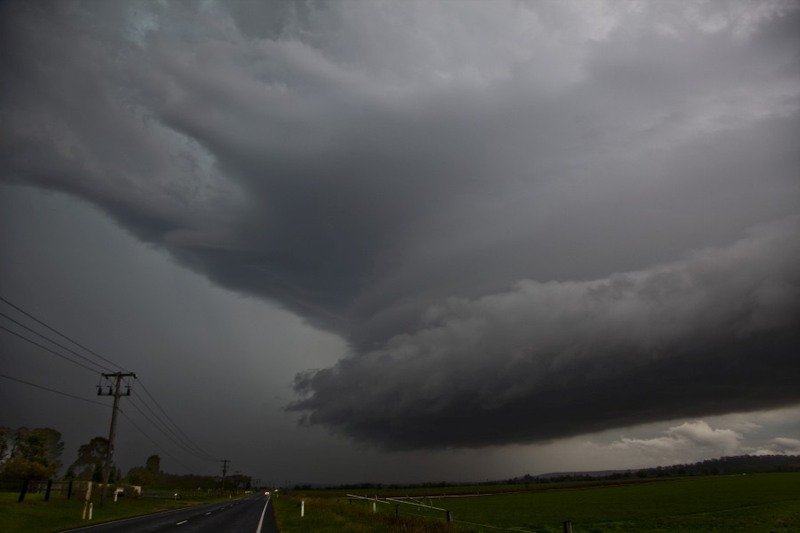 On the Golden Highway there it was in its structured beauty - supercell structure. I had achieved what I had not been able to do previously probably due to the slower pace of the supercell. 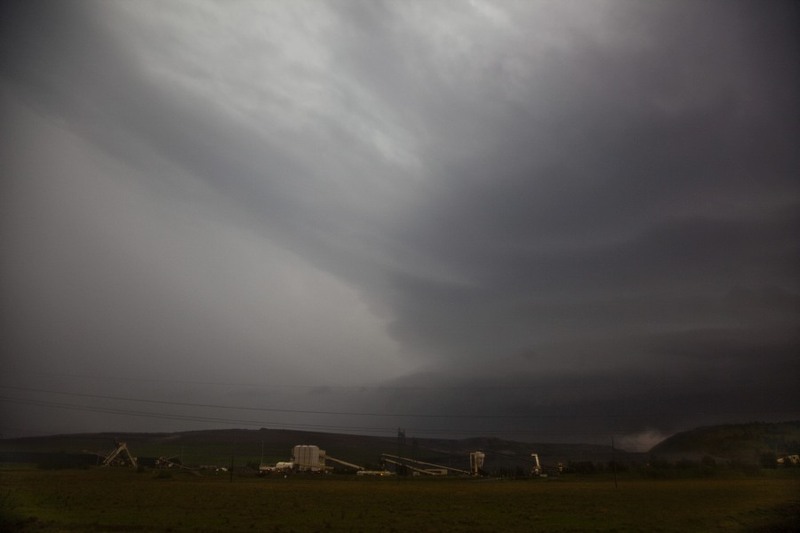 The storm began to weaken after about another 10 to 15 minutes but this revealed more of the structure. A bolt crashed down sending me into the vehicle! 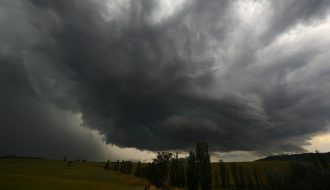 The report was logged with the Bureau of Meteorology and then whilst still talking to Michael Thomas - more green tinge! This storm is still going? 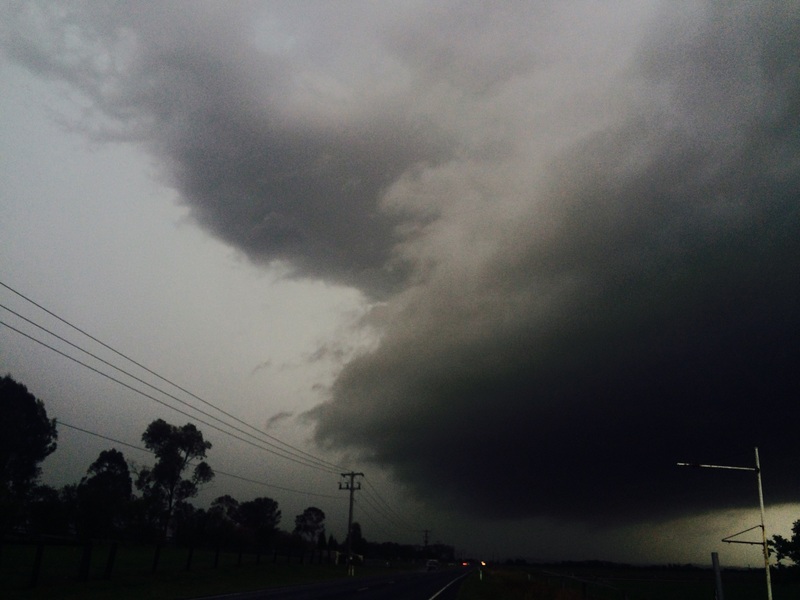 What I did not realise was that another storm possibly another supercell had allowed its path. 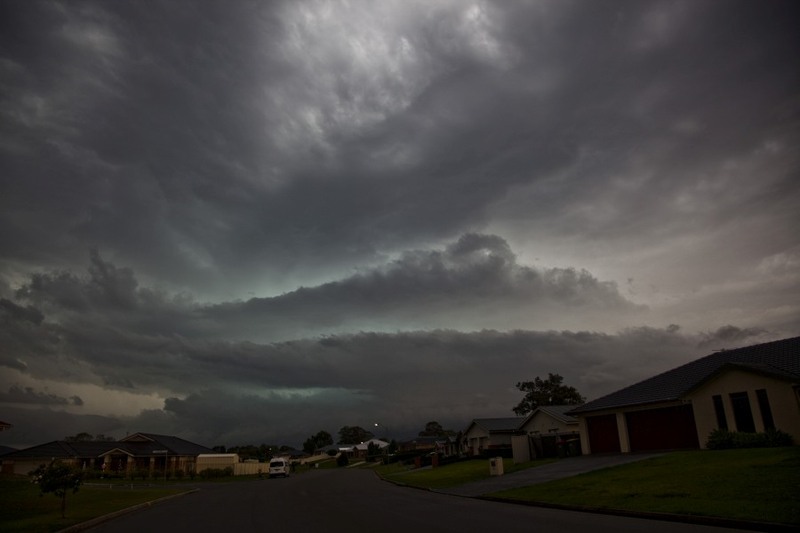 Nicely structure shelf cloud and serious lightning bolts. I positioned for some footage and photographs in an estate of Singleton. 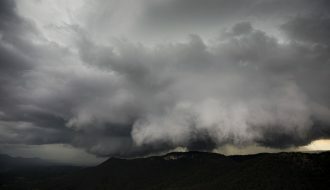 I let the storm go but surprisingly, the for packed some punch with strong winds and heavy rain. Muswellbrook next stop! Alas, with my mind more intent on seeing the Muswellbrook structure, out of the corner of my right eye was this green tinge! 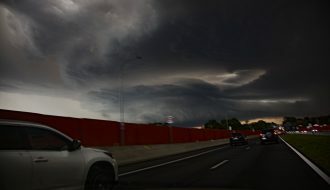 The singleton storm has erupted once again! 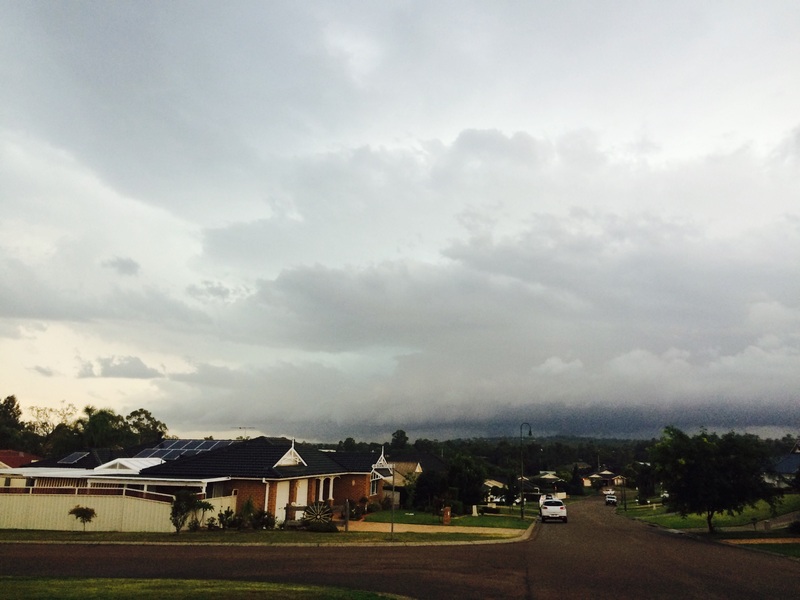 There was no chance of getting this storm and I continued on to Muswellbrook. With twilight imminent, only meagre structure but more frequent lightning featured in this storm. 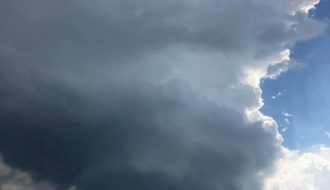 Stratus had hidden some of its view and the storm had moved back east once more! 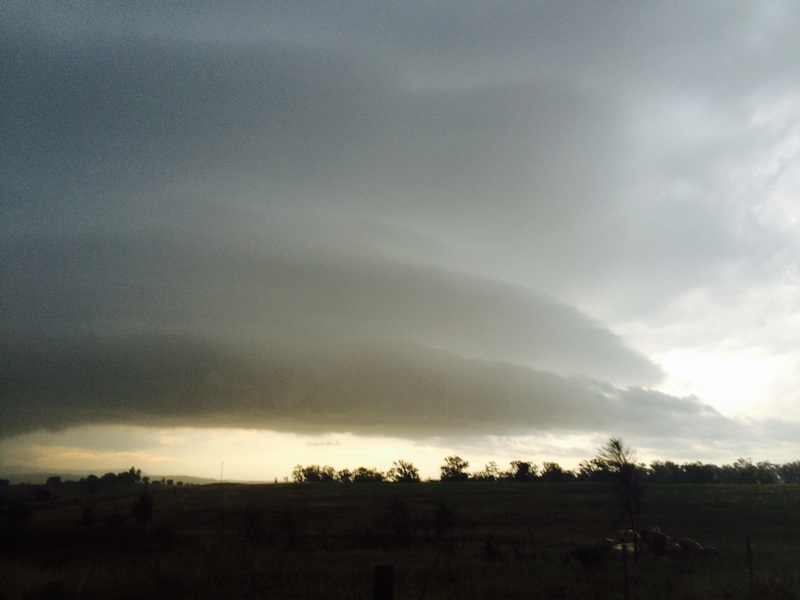 A second storm approaches captured on I-phone - seemingly exhibiting a supercell structure. 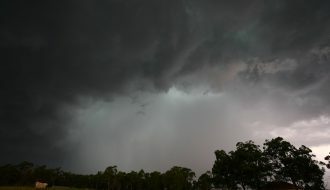 The road back to Singleton was amazing - full of intense strobing lightning and some lightning including cannon thunder! I met with Nick Moir who had chased the mountains and go the initial well structure stage of the Putty cell as well as others. A special thanks to Nick for providing critical updates when it was necessary to justify the chase strategy into the Putty. 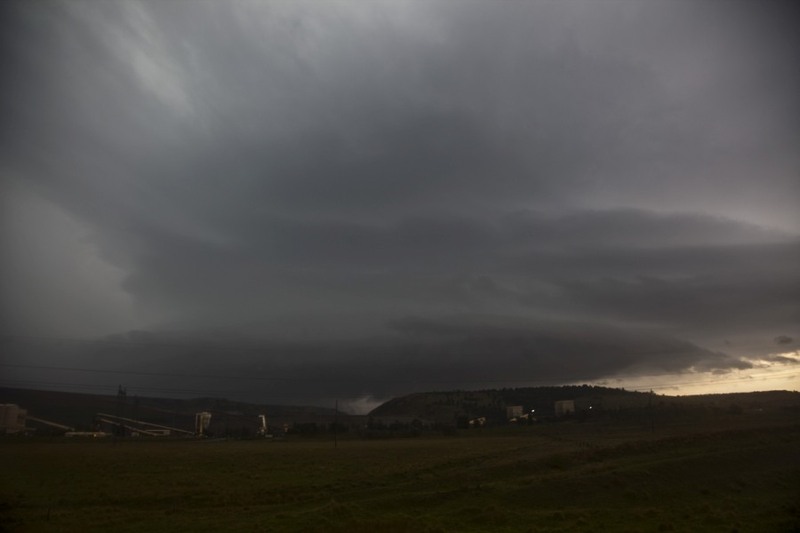 Nick, thanks for posting the time-lapse. 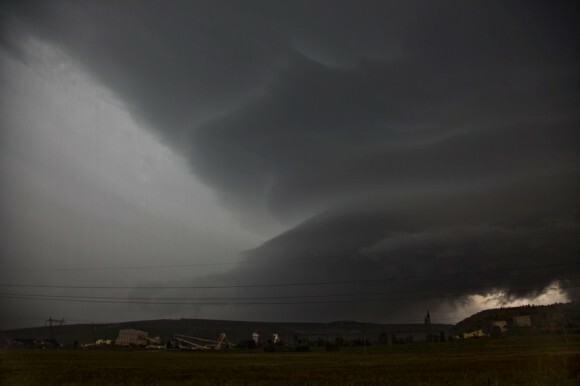 It is awesome to see the inflow and cow catchers on so many of these storms! Nothing like ideal wind shear! 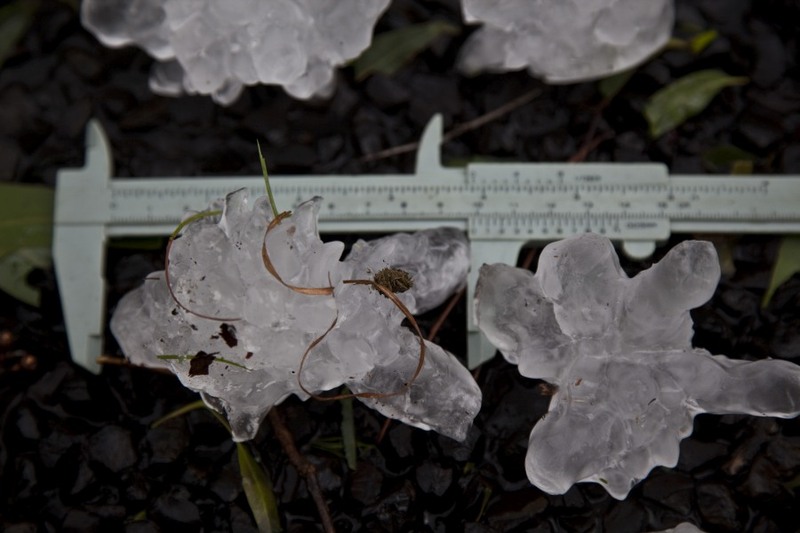 Talking to Nick earlier and he made a valid point: the longer spike makes this hailstone about 10.2cm – might have to use a photoshop technique to turn the around tge hailstone image with the caliper. Also has an opportunity to be on channel 7 news!